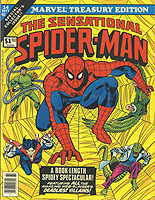 This page includes comic book collections published in the oversized treasury edition format, which was typically about 10" x 13". 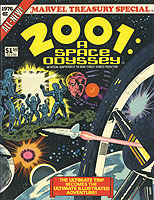 Although this format was primarily used to reprint Golden Age fare when it was introduced in the early 1970s, it was being used by the late 1970s to showcase special one-shots. 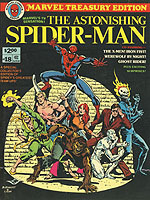 The format was essentially abandoned by the early 1980s, due to the rising costs of comic book production. Due to their tremendous size, these book were a hassle to store, and thus it is more difficult to find them in higher grade condition. 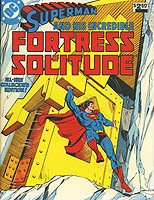 AKA Superman and His Incredible Fortress of Solitude. Guest-starring Black Pirate, The Gay Ghost, Mr. Terrific and Wildcat. Stories by Gardner Fox and Charles Moulton. Art by Bill Finger and Charles Moulton. Note: This is the rare hardbound edition. 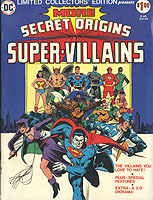 AKA More Secret Origins Super-Villains. Stories by Stan Lee. 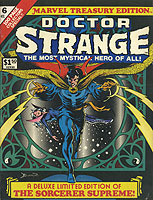 Art by Frank Brunner, Gene Colan and Steve Ditko. Stories by Stan Lee. 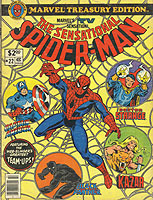 Art by Gil Kane and Marie Severin. 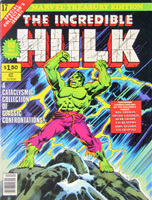 Art by Gil Kane, John Severin and Herb Trimpe. Guest-starring Ghost Rider and The Uncanny X-Men. Stories by Roy Thomas. 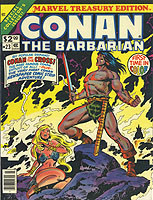 Art by John Buscema and Gray Morrow. 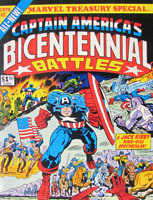 AKA Captain America's Bicentennial Battles. Stories by Jack Kirby. Art by Jack Kirby, John Romita, Barry Smith and Herb Trimpe. 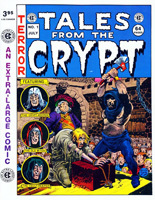 Art by Jack Davis, Graham Ingels aka Ghastly and Al Williamson.